Our team here at Remora is always looking to enhance your experience (as well as the experience of your online customers), which is why we are proud to announce the latest feature to earn a spot on our platform: Incentive Page Types. With this tool on your side, creating and customizing incentive list pages via a variety of different options - from manufacturer specials and custom feeds to incentive types that range from special financing to lease deals - is a breeze. Want to learn even more about how you can leverage this powerful new tool in just a few short minutes to supercharge the incentive experience for your customers and sell more cars? Then follow along as we break down everything you need to know about our most recent addition to the Remora platform. After doing this, one thing is for certain: It won't be long before your dealerships is breezing past the competition, selling more cars in your local marketplace, and enjoying all of the benefits that come with the brand-new Incentive Page Types tool from Remora. 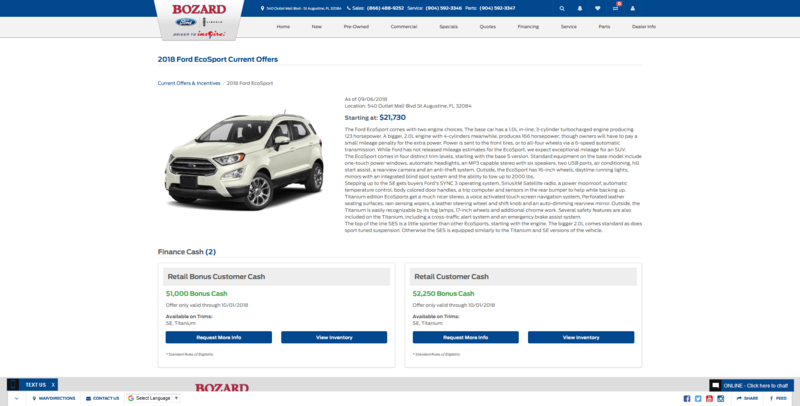 The best place to start this conversation is by showing you exactly how custom incentive pages work once customers land on your dealership website. To do this, take a look at the example image of a custom incentive page shown below. As you can see, this sleek and streamlined page offers up two actionable sections for the end user: A filter sidebar and a grid-style listing of each vehicle in your inventory that currently has an applicable incentive attached to it. Of course, this is just scratching the surface when it comes to supplying your audience with information that helps turn prospective shoppers into satisfied customers. 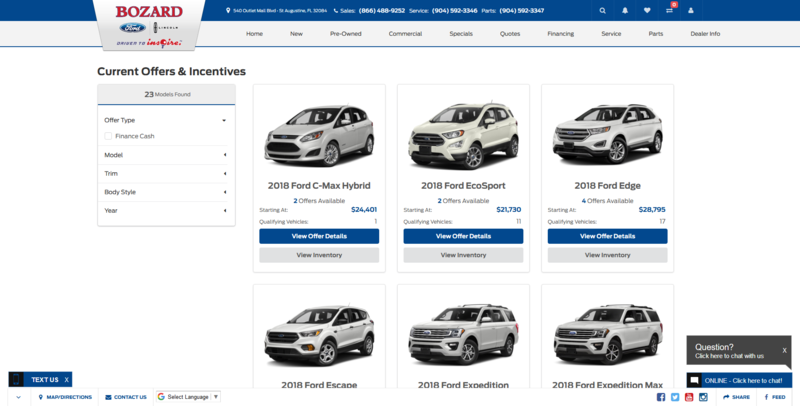 So what happens once a user selects one of these new offers on your dealership's own custom "Current Offers & Incentives" page? As the above image shows, this future happy car owner will now land directly on an expanded detail page that offers up a wealth of information related to the associated incentive(s). Each current offer is also broken down to incorporate all information on the offer, a "Request More Info" button, and a "View Inventory" button. When creating an incentive page, you'll have three different sources for these incentives to come from (including "OEM," "User," and "Feed"), all of which populate automatically based on the associated provider. If you'd like to restrict the types of offers shown, you can deselect any of the four preset offer type options on the page, which include "Finance Cash," "Finance Offers," "Lease Cash," and "Lease Offers." Oh and don't worry; once these offers hit the shown expiry date our platform will automatically remove the expired content and reload the page to show any fresh or renewed deals from your chosen sources. As far as why this tool can mean so much to your dealership, we have both a short and a long answer to this question. The short answer: Dealerships demanded it, and our team here at Remora has quite the history of rising to the challenge when it comes to giving our customers what they want. Of course, you already knew this, which is why we'll go ahead and dig into the long answer. Essentially, by offering up yet another tool that bolsters the end user experience, your dealership ensures that a potential gap in the sales funnel - specifically users who may be on the verge of reaching out to a member of your sales team but would otherwise drift away without clear, concise, and accurate access to incentive offers and deals - is shored up in a powerful and effective manner. The best part? This chance to connect with intrigued customers and rack up contact form fills, sales or leasing opportunities, and expand time spent on site by the end user comes packaged in the same sleek, lighting-fast package that you've come to expect from the Remora team. In other words, looking good and maintaining the industry-leading performance and optimized customer experience that serves as the foundation for all sites powered by Remora is a key part of the process for any dealership that takes advantage of this impressive new feature. With this information at your disposal, you now have all the tools you need to take advantage of the new Incentive Page Types tool from Remora and truly maximize your impact for interested customers in your local market. Go ahead and give this new feature a spin today - and be on the lookout for our next update as we continue to dream up and develop exciting new possibilities for the Internet's leading automotive dealership website platform.